While climate activists celebrate Tim DeChristopher's release from prison this Earth Day, they should also celebrate his influence on the powerful movement that transpired in his absence. Yesterday, after 21 months in federal custody, climate activist Tim DeChristopher approached the pulpit at his church in Salt Lake City, Utah, as a free man. The First Unitarian congregation rose in uproarious applause, tears streaming down more than a few faces. “It’s good to be home,” DeChristopher told the crowd. The story of how DeChristopher landed in prison is well known. On Dec. 19, 2008, he walked into an oil and gas auction in Salt Lake City, where the Bureau of Land Management was auctioning off leases to drill on public lands. When asked if he had come to bid, DeChristopher, somewhat startled, said yes. He took a paddle, labeled “Bidder 70,” and without any plan as to what he would do with it, entered the auction. But then, when he saw a friend across the room break down in tears over the potential loss of wild lands, an idea came to him. He began raising his paddle to bid. By the end, he’d amassed a total of 22,500 acres at a price of $1.8 million. Although the Obama administration later declared the auction illegal, and DeChristopher eventually raised enough money to buy the land he had bid on, two of the felony charges against him stuck. After a trial delayed nine times by the prosecution, he finally received a two-year sentence in July 2011. But that’s the Tim DeChristopher story you already know. What often gets overlooked in this folk-hero tale of a man who went to jail for his principles is that DeChristopher didn’t want to be the only hero. And so he became one of the most consistent and strongest voices for direct action and civil disobedience in the movement, urging environmental groups to use personal sacrifice as means of becoming more effective. 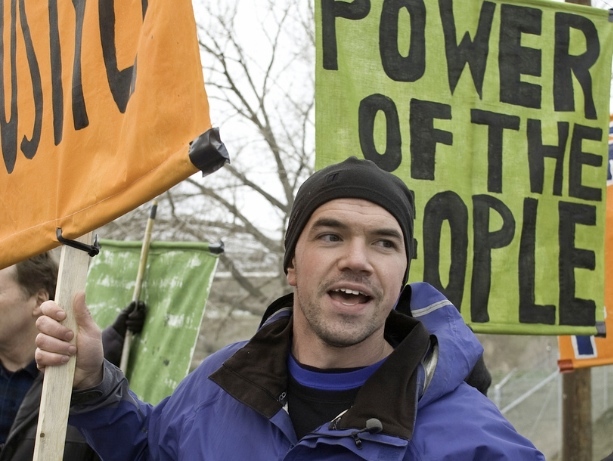 By showing that people who don’t hold positions of authority can successfully confront injustice, his example helped to build the climate justice group Peaceful Uprising, changed the tactics of the nation’s most established environmental organizations and helped shape the mass climate movement, which turned out nearly 50,000 people on the National Mall in Washington, D.C., in February. DeChristopher saw things differently, and he wasn’t afraid to say so. He thought the movement already had the numbers it needed to succeed if people would step up and act — with the belief that their actions would propel more people into motion and build the movement’s numbers. He began to argue that groups like 350.org needed to stop waiting and start using civil disobedience now. Shortly after the Bidder 70 action, DeChristopher founded Peaceful Uprising, or PeaceUp, with his friend from the University of Utah, Ashley Anderson. Their intention was to radicalize the movement by making civil disobedience more the norm than the exception. PeaceUp aimed to push people to sacrifice their own comfort and take bolder action for the sake of a liveable future. That may sound a little austere, but the group managed to make it rejuvenating and joyful by cultivating a supportive community. Before his imprisonment, DeChristopher continued to speak publicly about the need for escalation. While he didn’t berate 350.org or other climate justice groups, his message was clearly aimed at them. He criticized the movement for focusing on mass gatherings that resulted in statements rather than action. Little by little, DeChristopher’s message was catching on through a series of events — each one larger than the last — that used civil disobedience. In April 2011, more than 350 climate justice supporters staged a sit-in at the Department of the Interior, and 21 were arrested. Among the participants was 58-year-old University of Utah librarian Joan Gregory, a founding member of Peaceful Uprising, who remains active to this day. It was her first arrest. A few months later, in August 2011, DeChristopher’s message came to life in a monumental way. During two weeks of sit-ins organized by the 350.org-affiliated Tar Sands Action, 1,253 people were arrested while protesting the Keystone XL pipeline. It was not only the largest civil disobedience demonstration by the climate movement but also the largest in decades for any environmental issue in the United States. 350.org founder Bill McKibben agreed, saying that DeChristopher “was and is a complete inspiration to all of us. His courage permeated everyone’s thinking.” While McKibben’s current work does not revolve solely around civil disobedience — he’s been building a successful divestment campaign over the course of the past year — the mass civil disobedience actions have demonstrated the campaign’s resolve. In turn, those actions likely provided the inspiration for the Sierra Club’s recent reversal of its 121-year-old ban on civil disobedience. Soon after, club leaders cuffed themselves to the White House gates, again over the issue of the Keystone XL pipeline. PeaceUp members have taken those words literally. At actions, its members can always be found singing upbeat, folksy songs, from “If I Had a Hammer” to “Have You Been to Jail for Justice?” Through song, colorful art like its giant paper mache puppets and the deep sense of camaraderie its members share, Peaceful Uprising has been successfully building a nurturing culture. Maintaining a joyful presence is part of Peaceful Uprising’s strategy of merging resilience and resistance. Instead of getting bogged down in campaigns that do nothing but oppose unwanted things, PeaceUp goes a step further and tries to embody the world its members want to create. For example, group members select a “hot spot” and “cool spot” for every campaign — the hot spot representing an injustice members want to stop and the cool spot representing a positive change that they want to create or bolster. Peaceful Uprising also models how a small group of committed people with little background in activism can quickly become a powerful force for change. Members have gained experience in legal observation, media relations, jail support and other elements of direct action, and they now serve as a valuable resource for the local community by providing trainings in nonviolent direct action. And that is precisely what happened, which is why the celebration yesterday and today is not just about one man’s release from prison. It’s also his influence on the powerful movement that transpired in his absence. Already, others are taking his place in prison. As Tim mentioned in his sermon yesterday, biologist and author Sandra Steingraber and two other activists were just imprisoned for 15 days after blocking access to a fracking gas storage site in New York to protect drinking water. This Earth Day, we thank Tim DeChristopher for steering our movement toward the path of courage. With countless lives on the line, it’s the path we need to take. This story was published as part of a special Earth Day collaboration with Yes! Magazine. Melanie writes on environmental justice and transitioning into a sustainable future. Follow her at @MJaeMartin. I recently moved to ND to be a “Landman” I know sounds terrible, but trust me I’m going to try to do whatever I can to use the knowledge in the opposite direction! I’d like to turn “fracking” on it’s heels…please add me to your movement and let me know whatever I can do to prevent the contamination of groundwater pollution, preservation of farm/wet/public lands etc.